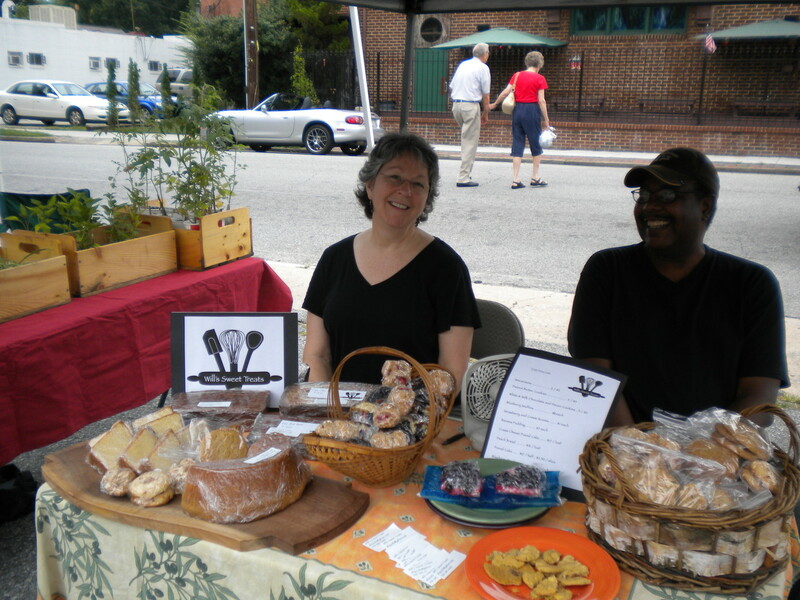 Our vendors are a diverse group--and some folks are seasonal. We work to support small local producers, makers, and sellers. Check out our vendor bios below to learn more about each of the local businesses you support by visiting the Corner Farmer's Market! 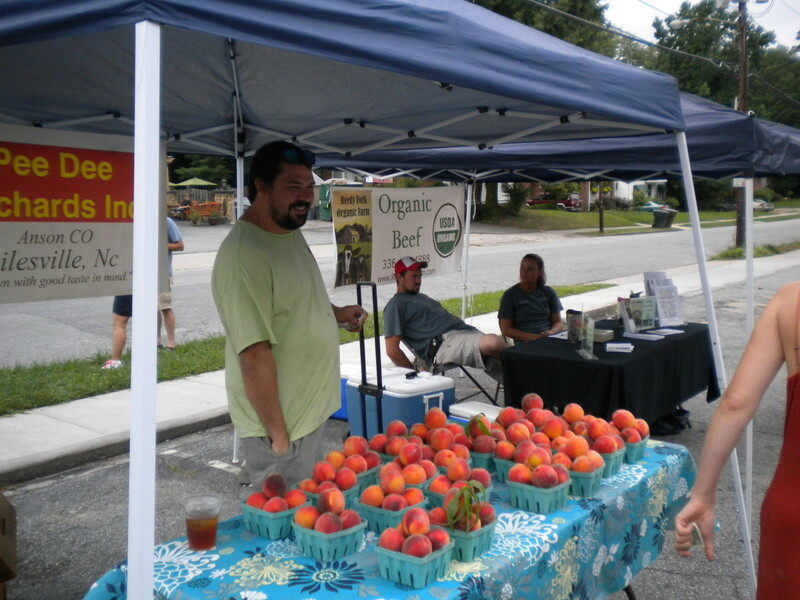 Bobby is a 4th generation farmer, with deep ties to the Piedmont area. Bobby began Coltrane Farms in the early 1970s and has produced quality productsthroughout the iterations of Coltrane Farms. And he's done all of this while he worked for the City of Greensboro for 30 years as their Landscape Superintendent! Coltrane Farms raises grass-fed beef, which you can find each week alongside locally sourced chicken and fresh seafood from the NC coast. Super delicious tomatoes are also in season at Coltrane Farms! The farm operates 4 large greenhouses filled with tomatoes and other veggies, vegetable plants, and amazing flowers and hanging baskets which Bobby grows for local businesses and for yourdelight. Coltrane Farms' cattle herd is 18 cows strong, and they graze on lush, green pasture at Reedy Fork Ranch. Bobby's beef is a big hit at the Corner Market, and you can find whatever cut your heart desires, including ground beef. 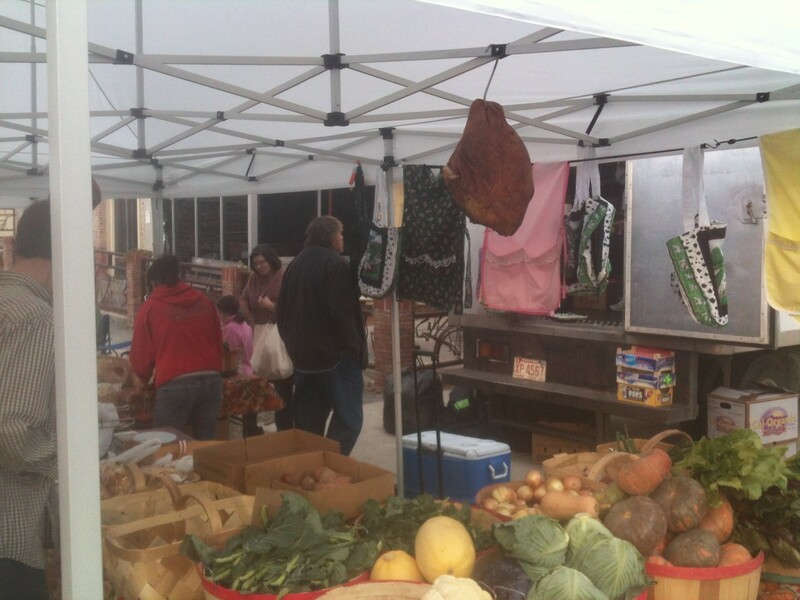 He also offers whole or half grass-fed and grass-finished cows! Because his seafood is fresh caught, products are varied and alwaysdelicious! If you want to be sure to get the type of seafood you're dreaming about each week, you can email Bobby to pre-order and ensure you go home with exactly what you and your family wants. 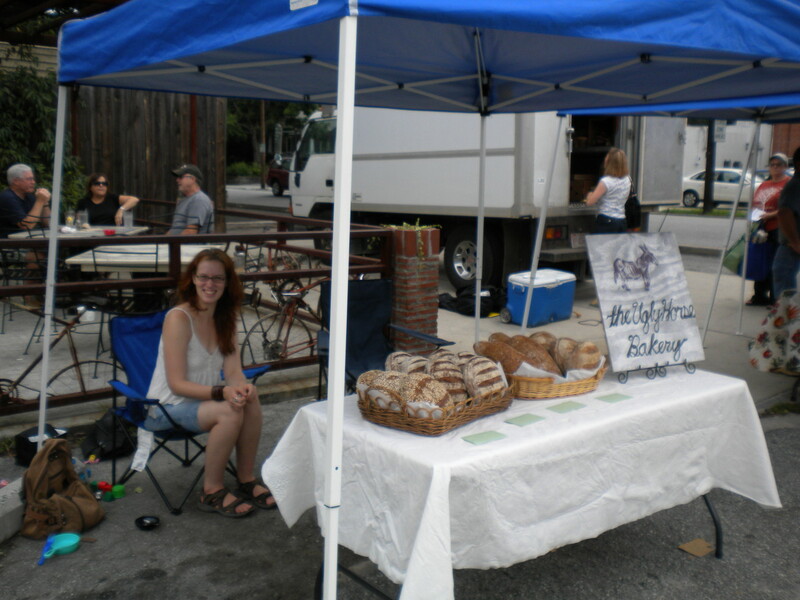 The chickenColtrane Farms offers is naturally raised and you can purchase the cuts of your choice: thighs, breasts, etc. When you stop by his table, be sure to stay and chat for a while. Bobby always has a smile to share and plenty of interesting stories and jokes too! Donna's Delights is a small business which offers handmade soaps, balms, body oils, lotions, scrubs, deodorants, laundry soaps, and knitted and crocheted items. Donna is a wife, mother, and grandmother who is very active in her church. You may be surprised to hear this, but Donna's Delights is a business created and grown only during her spare time! Wow! Donna began making soap as a summer family activity while visiting her parents, and turned it into a small business. Initially she dragged her heels about making soap after she returned from visiting her parents because she knew full well that she enjoyed it enough to make it into a business (and oh, the challenges of starting a small business!). After 8 years of working with soap, Donna has added other items to her inventory, including: Balms, Body oils, Lotions, Scrubs, Deodorant, Laundry Soap, and her various knitted and crocheted items. This summer will mark her 8th year at the Southeast Thresher’s Reunion where she sets up in the craft barn. During this event, she not only sells her products but she also teaches and demonstrates how to make the items she sells. Come out and visit her July 1st-5th and see how it’s done! Don't miss out! Stephen is both a vendor and the main brain behind the Corner Market operations! He provides locally and organically grown produce and herbs, and has a range of seasonal jam, jellies, and chutneys made from produce he grows or things he likes a lot (Luscious Lemon or Key Lime Curd, for example). 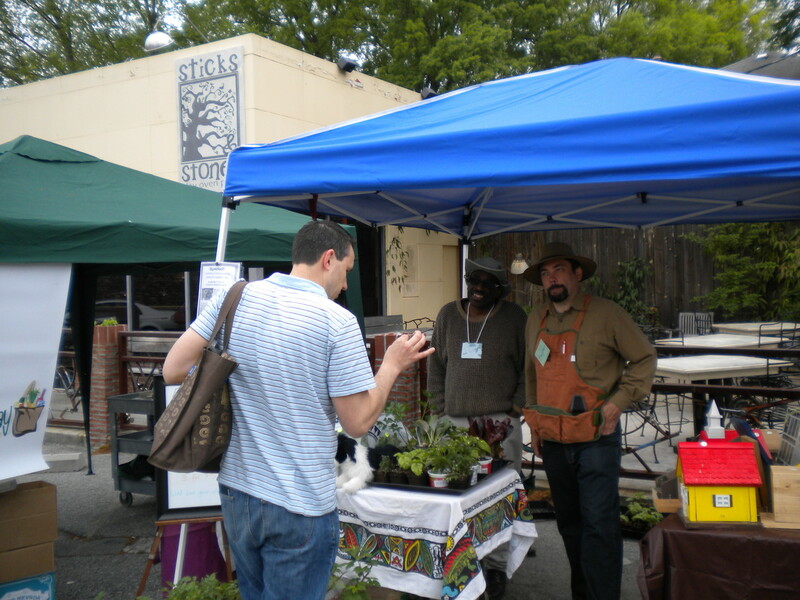 When you join us for a Saturday or Wednesday Market you'll certainly see Stephen smiling, greeting old and new friends, and helping others set up their tables, all while wearing his signature hat. 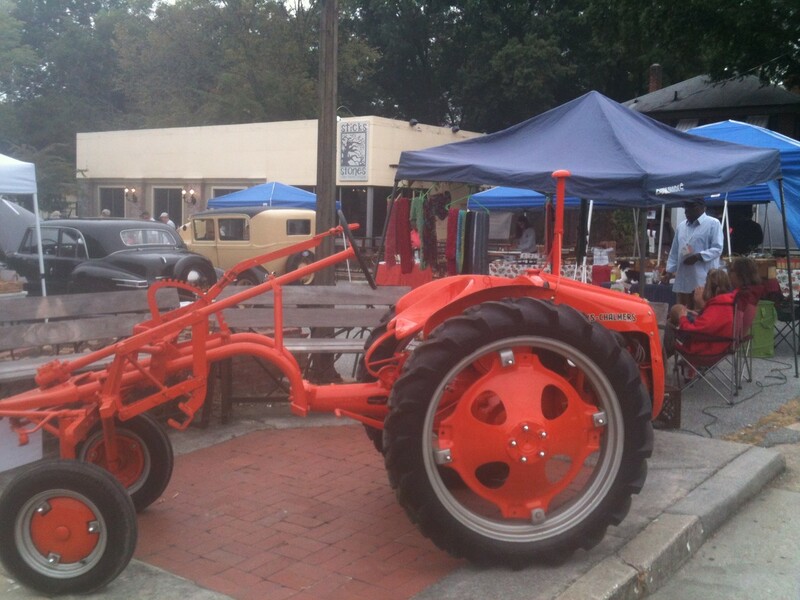 Faucette Farms has a rich heritage in North Carolina dating back to the early 1900s. The farm was founded as a small family tobacco farm with minimal amounts of produce. Throughout seven generations, the Faucettes have poured their love, energy and respect into the land in order to squeeze out just enough to support their families. Thanks to the hard work of loyal employees, the farm has been able to grow exponentially in comparison to its humble beginnings. Today, Faucette Farms is also able to supply produce to a multitude of families in the community and other establishments. 2008 was a year that brought unique changes to the farm. Strawberries were grown at the farm for the first time. The berries proved to be a huge success and were enjoyed by many families in the local community. Grove Winery also used them to make their muti-award winning strawberry wine. Once the weather became too warm for the strawberries, our focus changed to providing a larger variety of certified organic produce to the public. 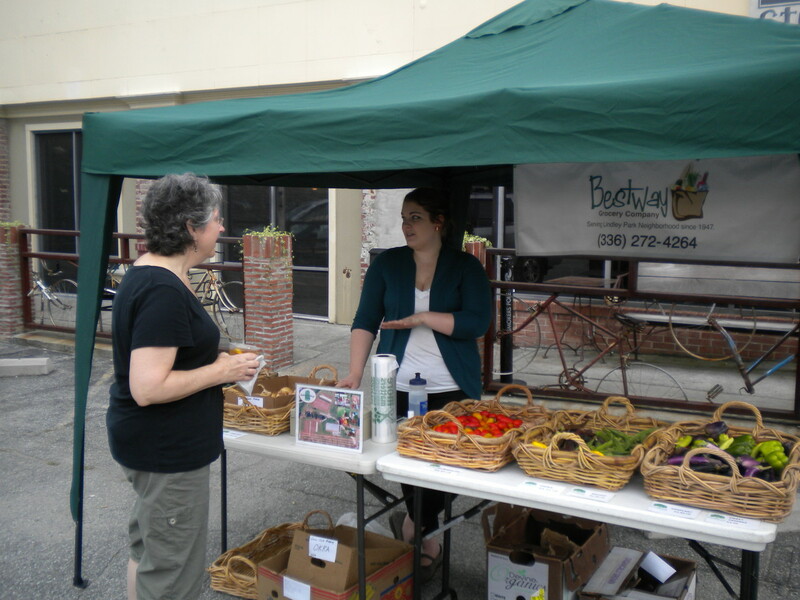 Faucette Farms has been a part of the Corner Farmer's Market since the very beginning, and you can always find them offering great produce and fantastic company. They also offer CSA memberships! We take extra care to raise and harvest all of our animals humanely. We process all of our animals on farm and honor their lives by using all parts of the bird. Ask us more about this, if you're interested! When our animals aren't eating wild, native plants, grass, bugs, and other small creatures, our animal clan is fed sprouted grains and non-GMO fed from local farmers. All of our animals live their lives on pasture and some even have free range of our entire property! They offer Fabricated By Dena's crocheted items at their table during the chilly months, crafted by Emma's mom. 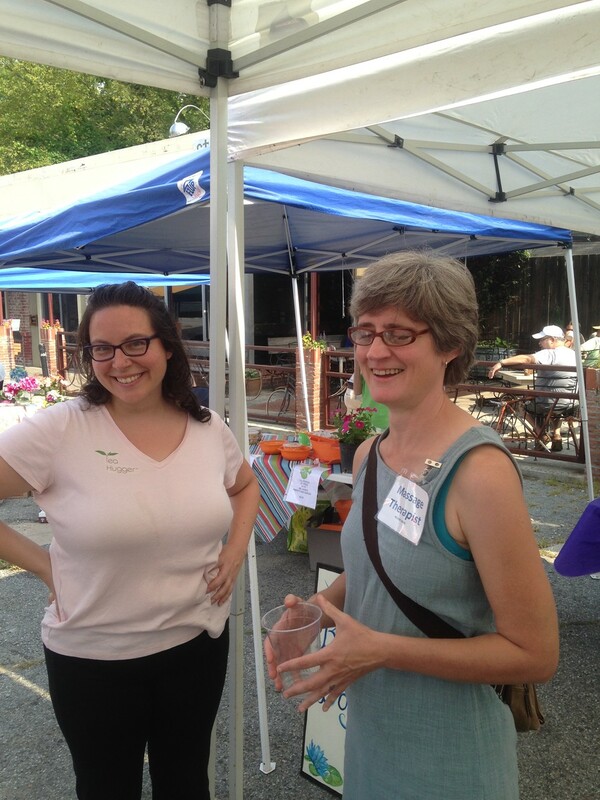 If you've ever been to the Corner Farmer's Market (and we're guessing you have!) you've certainly seen Ms. Linda and heard her trademark question, "Would you like to try a sample?" And if you've heard her ask, you've likely reached over to try one of those goodies on a platter! When you taste her delicious Pimento & Cheese, you can understand how the recipe has been in her family for 3 generations. Delicious, creamy, and homemade, her Pimento & Cheese goes wonderfully with many things, including pickles! Her Stuffed Dill Pickles are a major hit, and you can find folks chowing down on them like there's no tomorrow. Ms. Linda has been making and selling her Pimento & Cheese for 30 years. Her secret recipe was passed down to her from her mother (and before that, her grandmother), and Ms. Linda has since tweaked and improved the secret ingredients to yield the amazing and fresh Pimento & Cheese that you enjoy today! In addition to offering Ms. Linda's Pimento & Cheese and Pimento & Cheese Stuffed Dill Pickles, she also offers Spicy Oyster Crackers in 4 flavors: crab, bleu cheese, sriracha, and parmesan; Spicy Cheese Cookies; and a new favorite: Ms. Linda's Pimento Poppers. These goodies are fried jalapeño poppers filled with her Pimento & Cheese and served with a spicy pepper jelly sauce. Ms. Linda is currently taking orders on these yummy Poppers, so stop by her table and ask her about how to pre-order. So the next time you swing by the Corner Farmer's Market, stroll by Ms. Linda's table, and hear "Do you want to try a sample?" be sure to say YES! 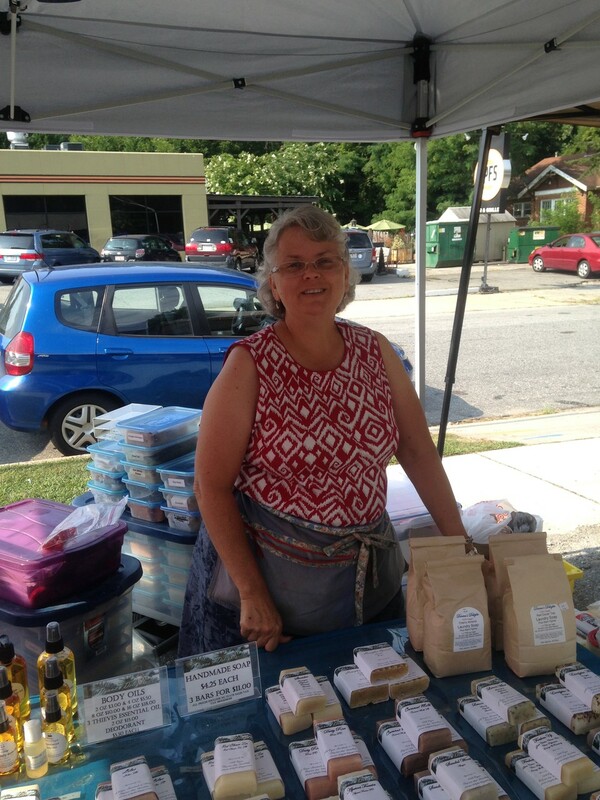 Cindy and her family specializes in GMO FREE, SOY FREE, PASTURED MEAT and DAIRY raised on petrochemical free pastures. High Foraged Heritage PORK Nutrient Dense and FERMENTED BEVERAGES are some of the other specialty products. In a world full of baked goods, over abundant in refined sugars, butter, artificial dyes and highly processed white flour, it's easy for those of us whose bodies require a little extra TLC and dietary consciousness to feel like the outsider. Whether you are vegan, have food sensitivities, or simply enjoy wholesome, organic goodies, you deserve to indulge just like everyone else! It is Wallflour's mission to bring you honest, vegan, gluten free treats baked with love that are not only good for you, but satisfy that desire to nosh decadently and without worry. Wallflour Bakery offers healthy, delicious, sweet alternatives that will put a smile on your face, all while nourishing you from the inside out. Food is the fuel to our being and Allison believes it is important to be kind to your body and consume only what works in harmony with your system. That being said, she knows we all deserve a cupcake... or a cookie... maybe even a slice of pie?... So go ahead! Devour that confection and do a little happy dance because you are not alone! April is a 9th generation farmer, with roots in NC since the 1760s. Wildwood Farm is located in Caswell County. All of April's products are grown organically and sustainably on the land surrounding her restored, 1820s farm house. Wildwood Farm offers organically raised eggs (the biggest you've ever seen!) and organically raised flowers. April is also an accomplished artist, offering her paintings of some of the most beautiful things in life: animals, plants, and flowers. April holds a degree in Landscape Design, and her attention to detail and artistic flare appear in her flower arrangements, as well. She will be bringing the most gorgeous Sunflowers, Bells of Ireland, Zinnias, Baby's Breath, Hydrangea, and Lilies in the near future. Wildwood farms offers both dried and fresh flower arrangements. Her walking sticks are hand painted and hand carved using primitive methods with wood harvested sustainably from Wildwood Farm. Some of her walking sticks have a very special history... She preserves tobacco stalks grown on her family's farm and transforms them into long-lasting pieces perfect for a long stroll. Be sure to ask her more about her farm's philosophy of responsible, sustainable, and organic living! We are a local home-based bakery that makes a variety of breads, pastries, cookies, cakes, and so much more using as many locally sourced and seasonal ingredients as possible. Also many of our breads and pastries feature wild yeast which is packed with nutrients and flavor. We have been in business since 2012. Shelby makes wonder cacti! Come out and grab yourself a cactus friend. Whether you're looking to spruce up your office space or give a cactus to a brown-thumbed friend, Shelby knows she has the perfect cactus friend for you. Welcome! 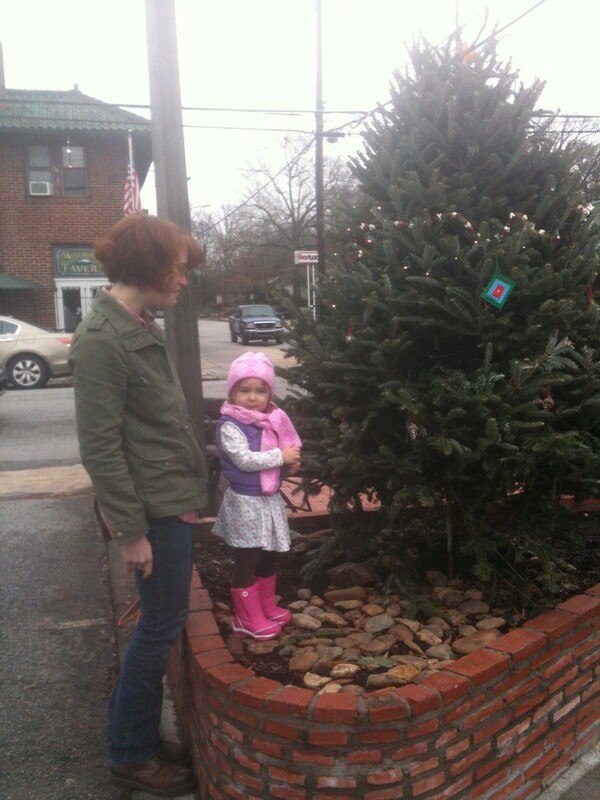 My name is Dena and I create functional couture for all sizes and organic okra ornaments. I design and fabricate all of the items you see by hand! When I crochet an item, I begin with an idea and a fiber and the item creates itself through my fingers. I taught myself how to crochet when I was eight, and because I learned in a way that others might consider "backwards," I design all of my own patterns and I love to play around with color and style. This means that each creation you see is unique and one-of-a-kind! The okra for my ornaments is organically grown by my husband and then properly treated to be a permanent and long-lasting ornament. People often purchase my ornaments for holiday decorating, but end up hanging their okra in a window throughout the year! I've been making and selling my okra ornaments for over 20 years. Each okra has its own quirks and personality. I let the okra tell me what decoration it needs and then I hand brush the paint colors and individually glue on each bead. Each okra has layers of paint and various colors and other tiny details. It takes days for each okra to be finished! Thank you for checking out my table, brought to you by my daughter and son-in-law at Kuska Wiñasun Homestead. You can email me for special orders or you can check out my Etsy shop for more details. Looking for candles - then drop by Get A Glow. Naturally dyed soy wax yed and scented naturally with herbs and spices in recycled containers (great for last minute gifts). 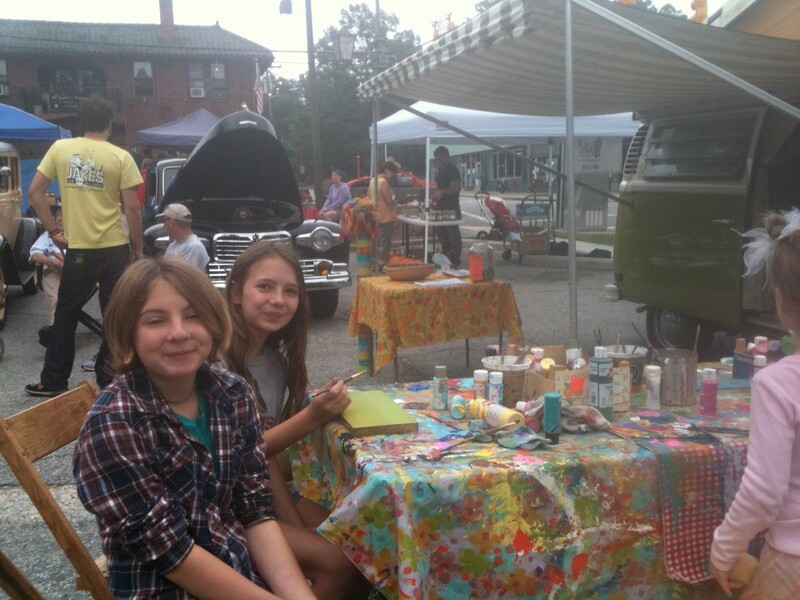 Claire provides locally made clothing includes Tie-Dye Apparel and Accessories with prices that inspire. $1 Clearance, $5 T-Shirts, $20 Outerwear & Linens. You can find out more at her website. Hello friends! My name is Sheri Vettel and I am the owner of Living on the Veg Tees. Living on the Veg sells veggie and other healthy food-inspired t-shirts for children and their families---I believe that wearing veggies leads to children talking about vegetables and being more willing to eat them. In fact, my son exclaims Kale Yeah! whenever this leafy green is on the menu! Overall, my hope is to get children and their families eating more vegetables, learning where their food comes from and supporting local agriculture. A little more about me... I am a Registered Dietitian and I work for a non-profit agency, The Partnership for Community Care (P4CC) in Greensboro. For every shirt I sell, I plan to donate $1 to a healthy food pantry at P4CC, The Partnership Pantry. I helped design and implement this food pantry in 2013 in an effort to assist low-income community members in managing chronic health conditions. 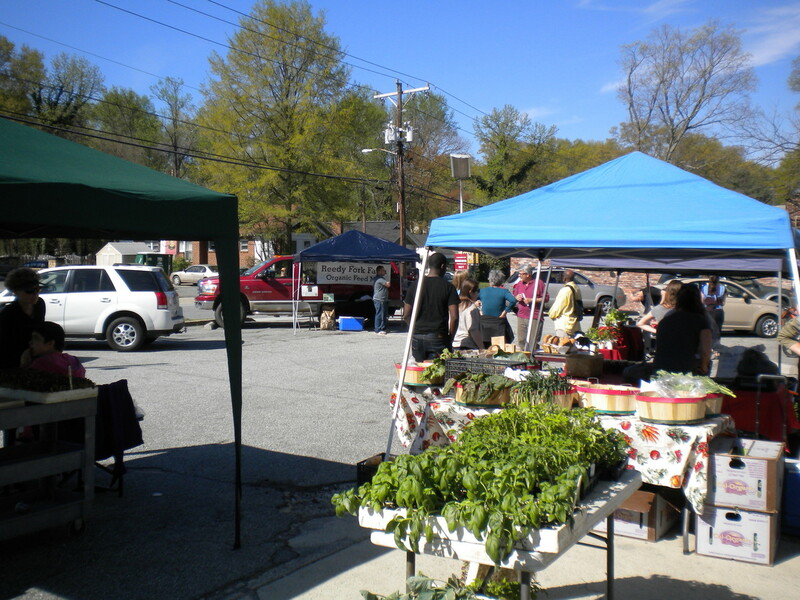 I am a foodie, I promote active living (I love yoga and hula hooping) and I love the farmer's market (especially the adorable Corner Market on Elam!). If I am not dreaming up ideas for veggie tees I am usually out and about with my husband and toddler on a little adventure! You can find Living on the Veg Tees on Facebook, at our shop website, and on Instagram! Be sure to follow us on social media for t-shirt preorders, contests and other promotions! Michelle is an amazing artist that joins us most Saturdays at the Corner! Don't be fooled by her modesty and quiet smile, she's a creative powerhouse! Michelle is originally from Potsdam, New York. She moved to Greensboro in 2013 after she graduated from the painting program at Alfred University in upstate New York. Michelle began her creative entrepreneurship by focusing primarily on painting, but about three years ago she started experimenting with sculpture and jewelry making. Originally a side project, she fell in love with jewelry making and couldn't help but turn it into a full time occupation! She has been working as a full time artist for about a year and half. All of Michelle's art is inspired by the beauty of nature, and each piece she creates intricately represents the magic of the natural world. Her paintings are landscape watercolors on wood, her jewelry is sculpted by hand with polymer clay and hand painted, and she also specializes in decorative clay masks. Each art piece requires many hours to complete, a keen eye for detail, and plenty of passion. Each piece also has an earthy depth that is difficult to articulate... Each piece looks as if it is from the earth, not just a representation of it! Michelle invokes all the natural layers of our earthly home in each pendant, painting, and sculpture. You can find Michelle most Saturdays at the Corner Farmer's Market, on Etsy and Facebook, and you can find her work at Artmongerz Gallery in downtown Greensboro! For the month of June 2016, Michelle is featured in a solo art show at Common Grounds coffee shop, which is just 2 steps away from the Corner Farmer's Market! 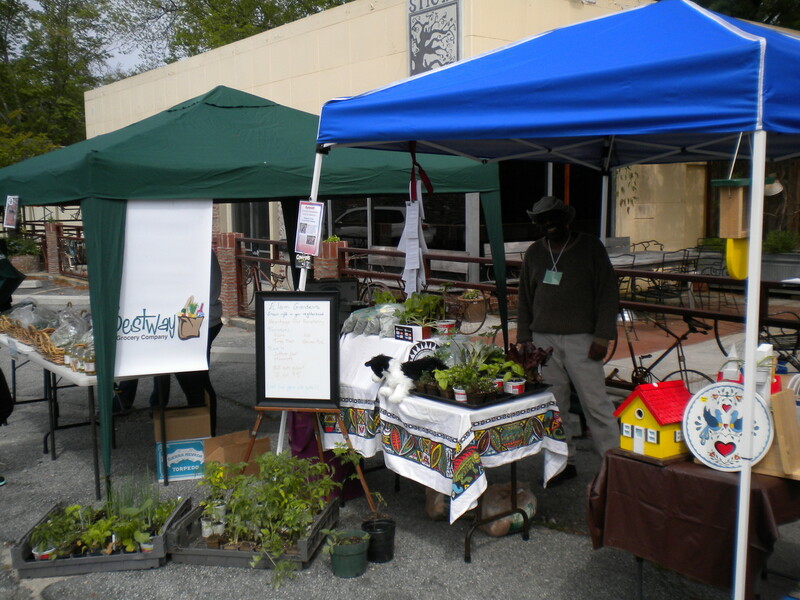 Neal’s Natives made its first appearance at the Saturday market in February 2016. John offers flowering plants, groundcovers, and grasses/sedges native to North Carolina, all grown in his Lindley Park backyard nursery. He has plants for sun, part sun, shade, even dry shade! Kelly believes that art has a unique ability to bridge cultures, inspiring positive transformation in individual lives and entire communities. 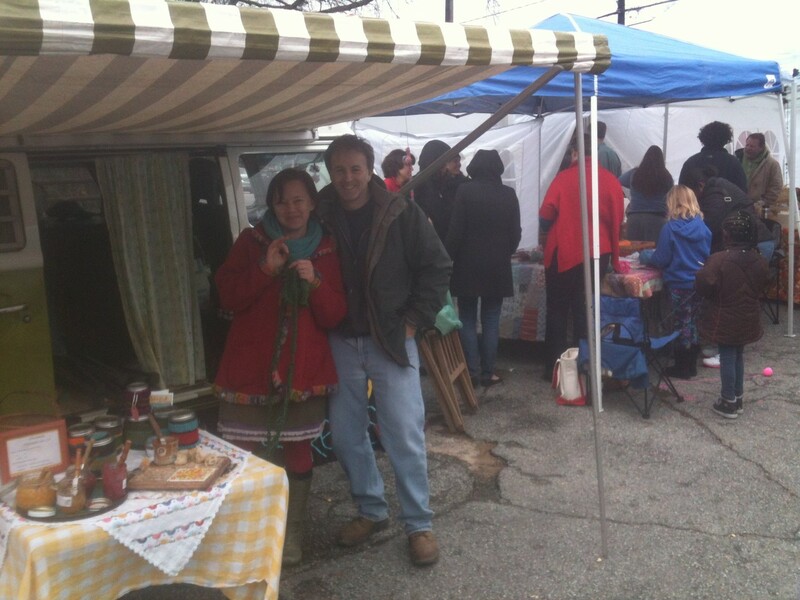 Philip is at the market with alpaca sweaters, scarves and other items. He's now able to take credit/debit cards. Also, fresh herbs, rosemary, thyme, sage. Jeff and Cathy have locally made earrings, pendants, doggie bandannas, and more. Sylvia has hand made jewelry. You can find out about her jewelry via jewelsgalore1917@gmail.com or call her on 336-965-4122. She even promises to deliver! Tara provides face painting, as well as selling her repurposed art - cards, magnets, picture frames, small watercolors; maybe one or two pieces of jewelry. Custom work is also available; customers can choose their stones and metals and truly have something that reflects their tastes or a one of a kind gift based on the recipient's tastes. Also, Tara is always available for painting faces at kids' parties and school events! Curt and Debbie Palat are Glass Artists. Curt is from Asheville, NC and Debbie is from Somerville, New Jersey. Their art marries Debbie’s Ceramic Engineering background and love of glass with Curt’s Mechanical Engineering background. Together they form TheoMarie Studios. TheoMarie Studios was established June of 2015. It grew out of the desire to embrace the dream of Debbie’s parents, Roy and Gilda Durnwirth, the artists of Craft’s Plus. Curt and Debbie’s work is created in Studio 27 at the 205 Collaborative. 205 is the largest working artists’ collaborative in Greensboro and is located on Lyndon Street. I am Beverly, and I love, love, love fabrics, colors, fun ideas for things to make. Now, I finally have time to play and create! My grandmother and mother got me sewing when I was 10, making doll clothes, and easy things for myself, like skirts. I sewed for myself through college, and later sewed for my two little boys, and did ambitious things like a down hunting jacket for my husband. Then, for years, I was involved in supporting my family, and did not do much in the line of creativity...just a little stained glass and pottery, which were real adventures! Now, retired, I am joyously playing, making simple, fun, and useful fabric items to share with you at the Corner Market. I do like it when folks suggest things that they would like, or that they have seen elsewhere and think would be a popular item. I will look forward to seeing you and hope you'll stop by, have look at what I bring each Saturday, and introduce yourself! 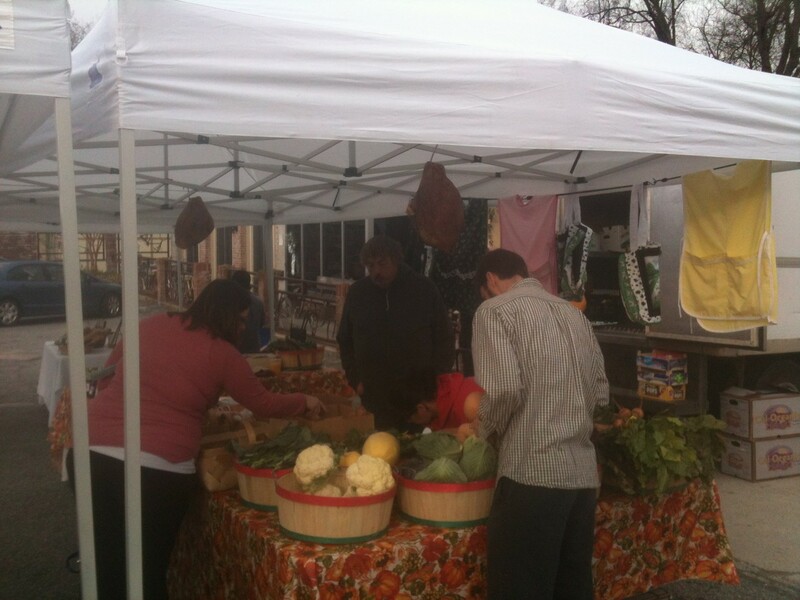 Emanuel provides greens and meats, generally through a CSA program. In winter he focuses on micro greens. Please try Sticks and Stones for their wonderful breakfast biscuits. You can check our Facebook page for more recent information. Check out our Join Us page for more details.